Pablo Zinger (Piazzolla`s ex-pianist) said: "Gorka Hermosa`s music impressed me for its originality, atmosphere and virtuosity: he makes the word "crossover" an intense reality. He`s a very talented musician to watch closely". 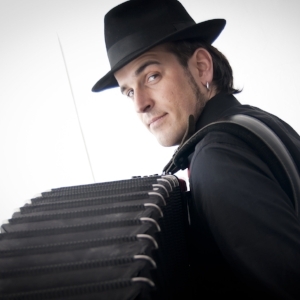 Born in 1976 in Urretxu (Basque Country), he is a very multifaceted musician: accordion player, composer, teacher, writer, and publisher. Gorka Hermosa was the first Spanish accordionist to play as soloist with many symphonic orchestras : The Spanish National Radio and TV Orchestra, and 12 times with other different orchestras. He often appears on Spanish TV and radio shows, and gives concerts all around Europe (Finland, Norway, Estonia, Germany, Slovenia, Switzerland, France, Italy, Portugal and Spain). He has premiered more than 20 works for accordion by Spanish composers. He plays in varied musical styles, including: flamenco, fado, folk, pop-rock, jazz, techno, fusion-- playing with musicians such as Paquito D`Rivera (Grammy Awarded), Javier Peixoto (Madredeus), Pablo Zinger, Ara Malikian, La Mari (Chambao), Luis Auserón (Radio Futura), Carmen París, José Luis Montón, Germán Díaz, Baldo Martínez, Carlos Soto (Celtas Cortos), Nacho Mastretta, India Martínez and others. As classical composer, his works are very often played by musicians of the 5 continents (U.S.A., Brazil, China, New Zealand, Madagascar, Russia, Lithuania, Great Britain, Germany, France, Italy, Slovenia, Bosnia, Serbia, Portugal, Spain), including some of the winners of the most important accordion competitions (Grayson Masefield, Dorin Grama, Alexander Verettenikov, Iñigo Aizpiolea, Martinas Levickis, Julien Gonzales) and other known players such as Alexander Selivanov, Yulia Amerikova, Helmut C. Jacobs or Renzo Ruggieri. His works have also been played in the graduation exams of the most important conservatories of the world (Moscow, London, Pekin, Shangai, Trossingen). He has published 3 of his own CDs, mostly featuring his compositions, and has made more than 20 discographical collaborations. He has written 4 books about the accordion and has given conferences about the history of the accordion in Macedonia, Italy and Spain. At present he is the accordion teacher of the “Jesús de Monasterio” Musical Conservatory of Santander.